Lil Ritchie won the 2013 Junior Olympic Metros championship. Joel Allen won the Battle of the Badges championship title in the middleweight division. 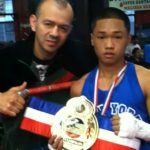 Villi Bello wins his first professional boxing fight. Villi Bello won the Professional WKA light middleweight championship by unanimous decision. Villi Bello (155 lbs) wins his last bout via 4th round KO at Friday Night Fights to become the new Middleweight Champion. Jordan Rodriguez (114 lbs) competed as a finalist in the 2013 Golden Gloves at Barclay Center.